With Serviator, front desk staff have access to up-to-the-minute information on room cleaning. They can see exactly when the room is expected to be ready and can give clear information to guests who want to check in early. They can also easily ask the cleaning staff to prioritize a certain room. Based on Serviator customer feedback we have enhanced the new version with a smarter interface and added a total of 19 new features. You can really tell the difference. It’s more user friendly and more clear. Serviator include both large and small hotels and facilities that represent every type on the market. 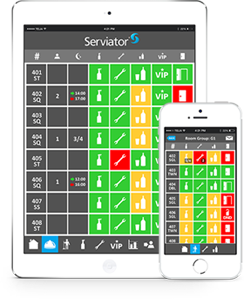 We customize Serviator to match each venue when it comes to features, but also when it comes to configuring users, rooms and more. Below is a list of the functions currently available in Serviator. Simplify communication between reception and garage staff that park and retrieve guests’ cars. Housekeeping manager and housekeepers receive a detailed list showing their assigned rooms and any other tasks. Would you like to know more about our Property Management solutions?